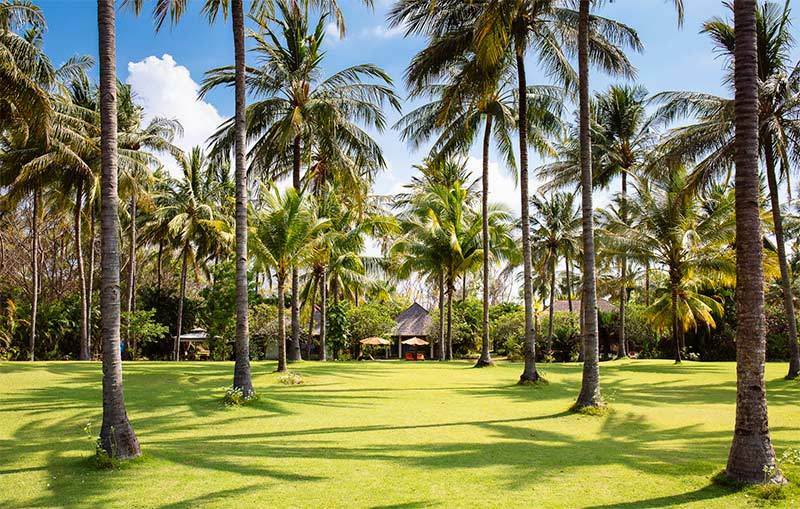 Spectacular Anandita rests within a huge coconut grove bordering the postcard-perfect, white-sand Sira Beach on the island of Lombok – Bali’s beautiful, but slightly shy, next-door neighbour. 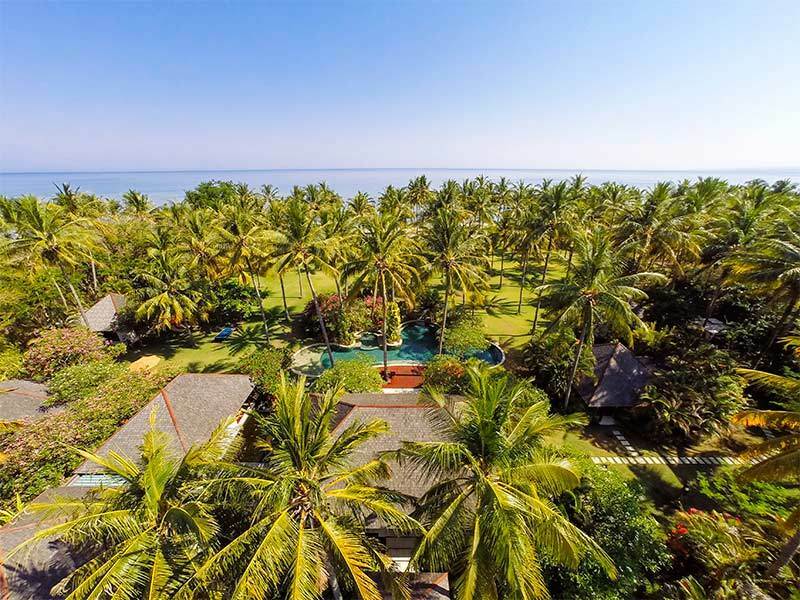 With acres of space and four delightful bedroom pavilions, The Anandita is ideal for families or groups of friends looking for a get-away-from-it-all holiday in a gorgeous, tropical island location while being pampered by a dedicated team of experienced staff. 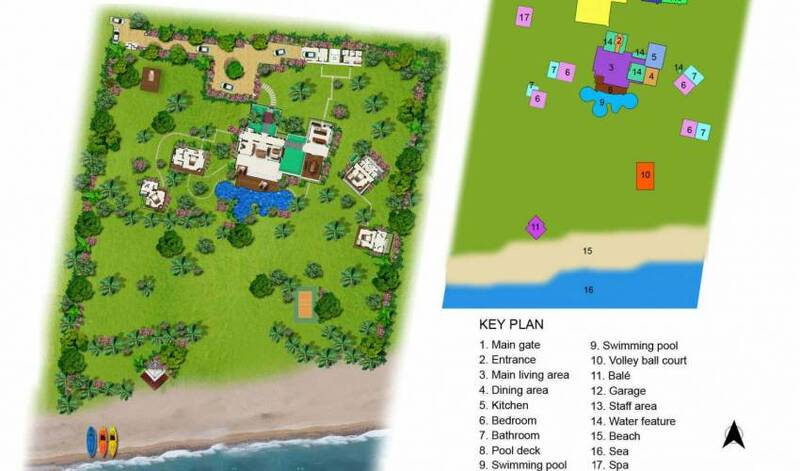 Outdoor activities abound, from swimming in the 26m free-form pool to volleyball on the lawn, snorkelling, sea kayaking and bike rides through traditional villages, to a round of golf on the adjacent and stunningly situated 18-hole championship course. Designed by Bali-based Australian architect John Lincoln – renowned for his work on the Four Seasons resort Hotel Jimbaran, the Westin Hotel Nusa Dua, as well as a number of five star hotels and private villas in and around Bali – the villa was built with a vision to create an oasis of peace and natural harmony and provides you with the opportunity to reunite body and soul with the environment as well as socialise with friends or family. The large open living areas, tall vaulted ceilings and the overflowing lotus pond by the dining pavilion provide a great sense of space and freedom. From the balé, dining room and every pavilion, one can hear the sound of birdsong, the waves slowly rolling onto the beach and the wind gently caressing the palm leaves. Built with precious woods from Kalimantan, white Palimanan stone from Bali and locally crafted terrazzo, the villa uses noble natural materials for a modern, yet highly classic luxurious architecture. Staying here offers a level of privacy that is difficult to find anywhere else. The one and a half hectares of ocean-facing land, and the white-sand beach that fringes it, are all yours. 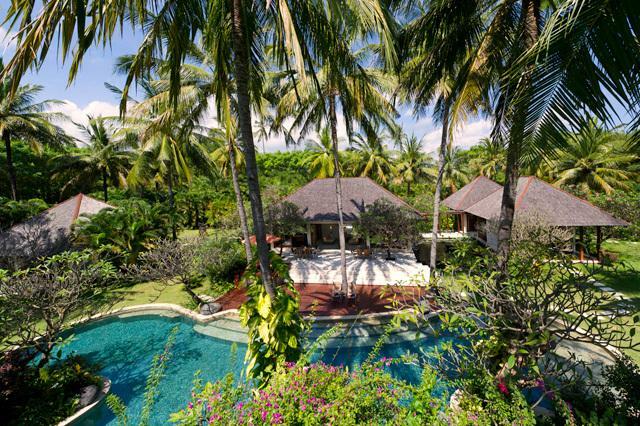 Relax and stimulate your senses at this villa. During your stay here, you will be pampered by a team of 20 dedicated and discreet members of staff. 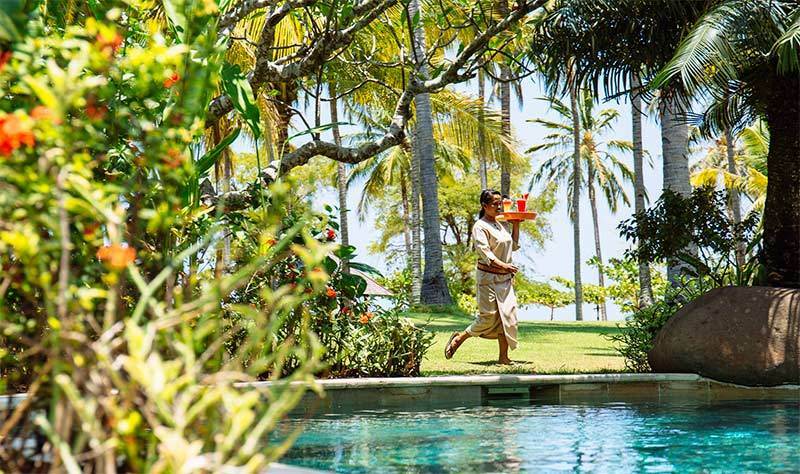 Our villa manager and his team will tailor the experience to your every need and desire. The Chef will shape every meal and dish around your requirements, providing a choice of Asian, Western or international meals. The breads and pastries served at the villa are home-baked. High tea, as well as beach or poolside snacks and cocktails are available around the clock. The villa also boasts a wide choice of wine, ranging from France’s St Emilion millésimes, to crûs from the New World. Explore nature, discover local culture, and revitalise yourself with the villa’s wide choice of sports and activities. Built on the edge of the Sira peninsula, the villa benefits from the wonders of one of the island’s most beautiful ecosystems. Just 200 metres from the beach via sea kayaks, you can swim amongst amazing multicoloured fauna and flora. The villa is approached by a private driveway, which leads into a secure parking area. A grand porte cochere, bordered by a lily pond, heralds the entrance to the villa’s main pavilion via a pair of impressive wooden doors. From here, a colonnaded walkway sheltered by a glass-roofed pergola leads over the lily pond to the kitchen and the dining pavilion. The four standalone sleeping pavilions are positioned in the garden, well away from the main pavilion. The expansive, fan-cooled living room has a high roof and presents three distinct, yet integrated areas. The central section is distinguished with a Palimanan frieze featuring carvings of birds, frogs, dragonflies, leaves and flowers, and flanking a stone floor that extends directly onto the pool deck through wide, folding glass doors. This area is furnished with two comfortable sofas strewn with playfully coloured scatter cushions, a chair and a rustic coffee table. The remainder of the room is slightly elevated with a polished wood floor that extends around the central sitting area in a U-shape. On one side is a more formal sitting area with segmented upholstered sofas, chairs and a flat screen TV–DVD player. The third area presents a billiard table, desk, bookshelves and guest washroom. The villa’s splendid dining pavilion is open on four sides under a soaring roof. Cooled by ceiling fans, the dining area is screened from the guest kitchen by attractive fretwork timber panels; one of the walls is graced with a collage featuring Thai elephants, while a Buddha’s-head statue guards the opposite side. Here, guests will be serenaded by the sounds of water-in-motion, charmed by the sight of dragonflies hovering around the fishpond, and captivated by the gorgeous views. A grand dining table for 12 takes centre stage in the pavilion with views through rows of coconut palms in the garden and onwards to the beach and ocean. The front section of the villa’s modern kitchen is well equipped for guest use, with a fridge, coffee machine and plenty of quality tableware and glassware. It also features a built-in breakfast bar furnished with ten chairs. The main staff kitchen is hidden behind a screen wall and is fully equipped with everything that the cook needs to prepare delicious meals. 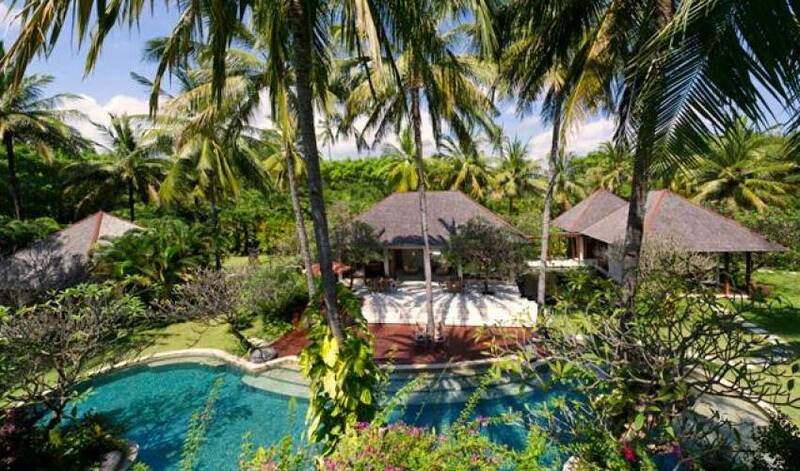 The villa boasts a multi-tiered pool deck crafted in both Palimanan stone and timber boards. 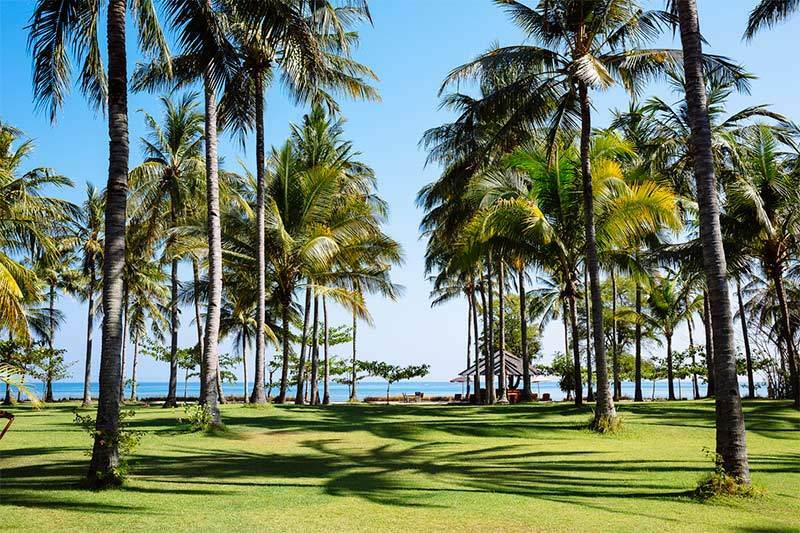 Here, three tall coconut trees and two frangipani trees offer dappled shade. The main level is furnished with two wooden tables and chairs, each offering a place for casual dining or socialising. An elevated timber deck is furnished with two sunbeds and an umbrella for daytime lounging, plus a table and chairs for a romantic candlelit dinner. Meanwhile, four wide stone steps lead down to another timber deck at pool level, offering more sunbeds and umbrellas. The free-form swimming pool is evocative of a jungle glade with a whirlpool hidden within a circular section. 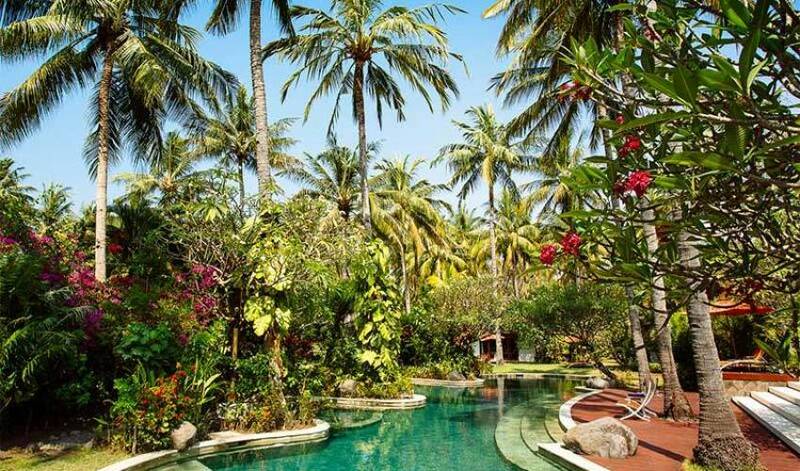 Like a small lagoon, the water wends its way through the garden, bordered by flowering shrubs and trees, river boulders and bushy palms. The villa’s four bedrooms are housed in individual pavilions which are arranged in pairs but spaced well apart for privacy. Although the pavilions are similar, each is styled with its own bold colour scheme and artwork, complemented by a dressing area and a sumptuous ensuite bathroom. A pair of the villa’s signature orange sunbeds and a matching umbrella offer peaceful spots for relaxation in front of each pavilion. 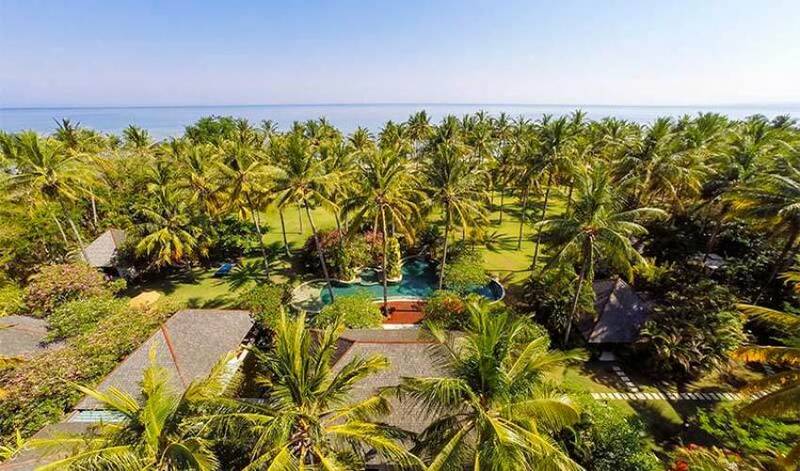 The villa is located at Sira (Sire), a spur of land bordered by a white ribbon of beach with magnificent views of the coastline, mountains and the neighbouring Gili Islands, just a short boat ride away. 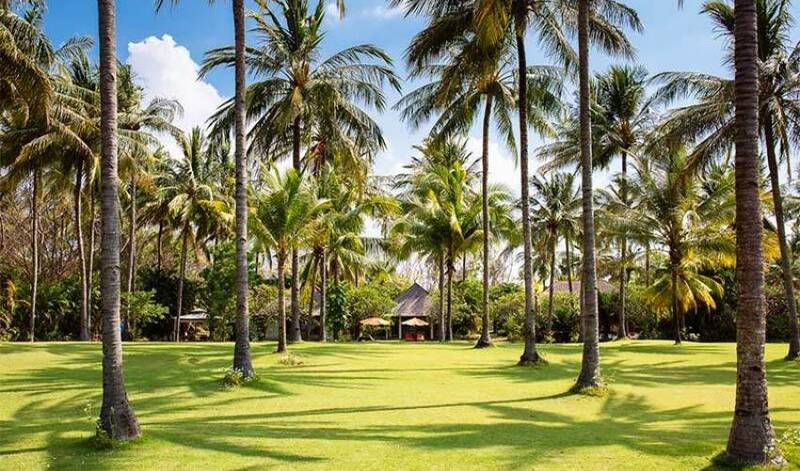 Next door is the Lombok Golf Kosaido Country Club, an 18-hole championship course, open to the public. 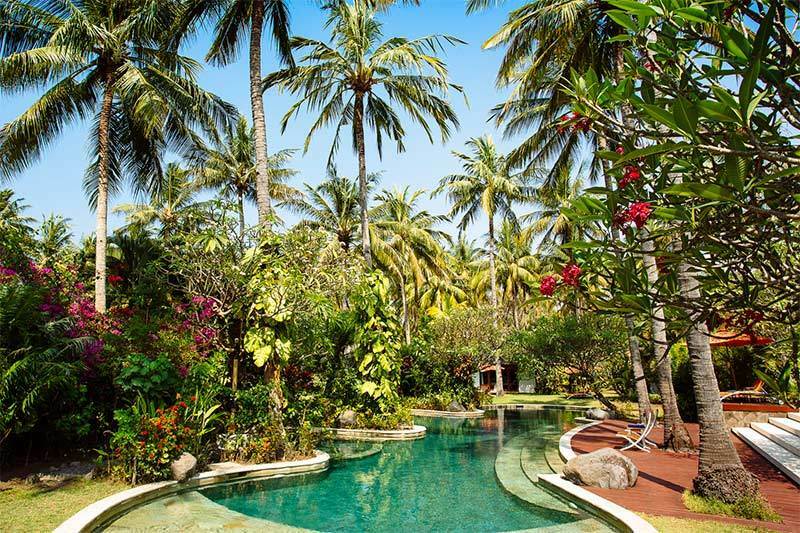 On the other side (five minutes’ walk along the beach) is Hotel Tugu Lombok, a funky-fantastic, atmospheric living museum of extraordinary Indonesian antiques, with a restaurant and bar. 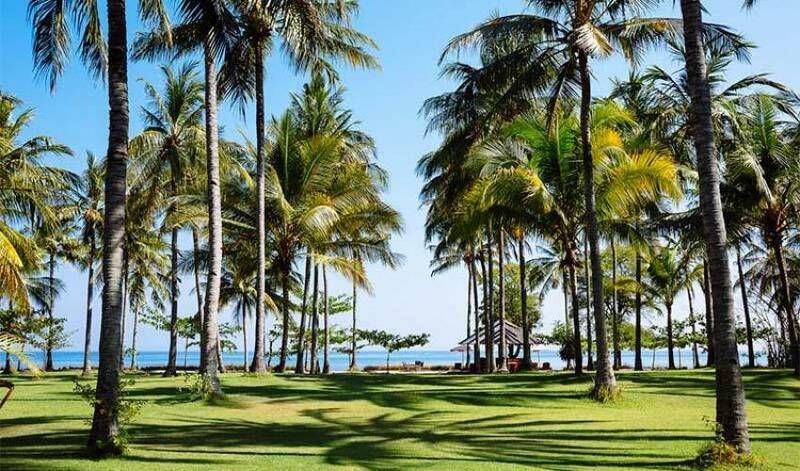 Tanjung (4km) is an attractive Sasak market village with stalls overflowing with local produce; this is also home to The Oberoi Lombok Hotel, complete with a jetty – should you wish to arrive by boat.